We had a pretty good Halloween this year. The holiday started off by going to the local pumpkin patch and picking out a great pumpkin for carving. This happens to be one of my favorite parts about Halloween because I get to be artistic using a different medium than I'm used to. My son wanted nothing to do with the pumpkin this year (what 2 year old doesn't want to dig in a pumpkin!?) so I just took over the project and created a pretty nifty carving out of it. I first found a design online and redrew it to fit my pumpkin. 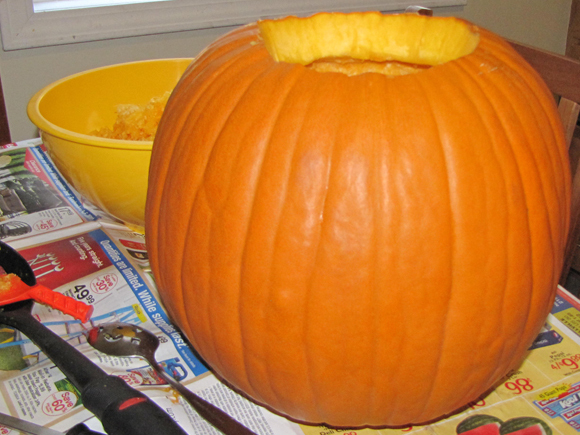 I then used our handy, dandy pumpkin carving kit to poke a bunch of holes for cutting out. It took me a couple hours to get everything done, but I think it was definitely worth it. 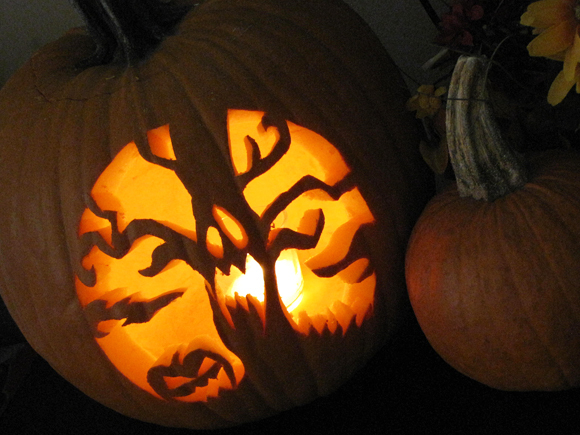 The design I carved wasn't as intricate as the haunted house I did last year, but it still turned out pretty good. 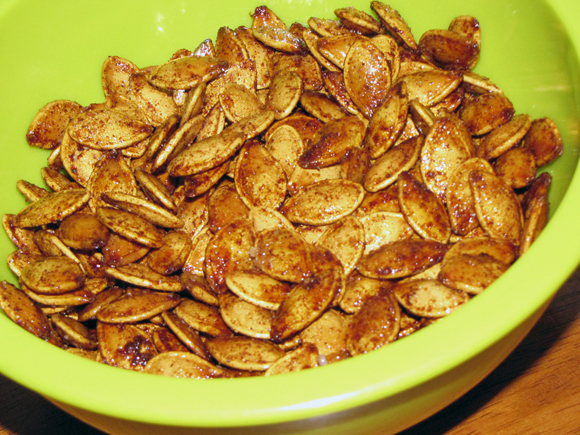 This year was the first time I saved the pumpkin seeds to roast. My Mother-In-Law used to make them when my husband was little so I thought I'd give it a shot. I decided to make a sweet version instead of the standard salty kind and they were quite tasty. I'm actually not a big fan of seeds so my husband was the main taste-tester. He's really picky so I was glad that he liked them! 2. Clean seeds by rinsing in cool water and pat dry. 3. Mix remaining ingredients together and toss with seeds. 4. Spray foil-lined baking sheet with non-stick spray. 5. Spread seeds over foil and roast for 50-60 minutes or until browned and hardened. Stir every 20 minutes to ensure even cooking. 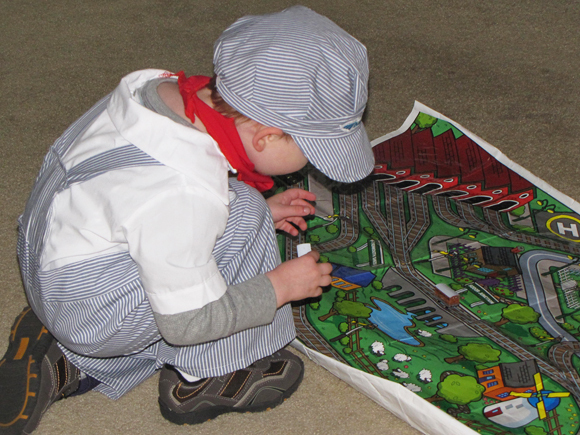 We finished up the day with taking my son trick-or-treating and...it was a bust. He was a little freaked out when we got to the first house but we thought we'd keep going so he could get used to it. Well, when we got to the second house, we were greeted by an evil clown. Needless to say, that was the end of our trick-or-treating adventure. We made a stop at my aunt's house and then a friend of my sister so he definitely got his share of candy though. I hope he'll be more open to the whole thing next year! Pinch Of Lime is on Facebook!